Just a quick glance at the Facebook page or Twitter feed of today’s modern teenagers gives us an insight into today’s standard of English literacy. “Y do teenz lyk 2 typ lyk dis”? Alas, I do not think the elder generations will ever really understand the trend. Maybe “dis way of writin” could actually be considered more scholarly than we care to believe. Perhaps the English language is merely reverting back to Old English or Frisian! Fashions do, after all, repeat themselves, and maybe the same is beginning to happen with regards the English language. Just a moment ago, I was reading an old book that I stumbled across: ‘The Cambridge History of the English Language: (Vol 1): the Beginnings to 1066’ by Richard M. Hogg, and was reminded how Frisian, a West Germanic language spoken in the province of Friesland, Netherlands, and parts of northern Germany, is the closest relative of English. In fact, Frisia was once a powerful and independent kingdom from the c.7th century, but lost its independence by the 15th century. To summarise, Old English and Frisian were, at one time, mutually intelligible. After the Battle of Hastings, English became influenced by Norman French, whilst Frisian became influenced more by the Dutch language. Frisian is similar to English in that both languages are rich in vowels, diphthongs and triphthong; but unlike Germanic languages, have nasal vowels, similar to Afrikaans. The Frisian “r” is similar to the English alveolar “r”, as opposed to an uvular sound in German or Dutch. An extract from ‘Beowulf’, a poem written in Old English. I was interested to hear the languages spoken, and a search on YouTube led me to a rather interesting documentary presented by Eddie Izzard, that was previously part of a series called ‘Mongrel Nation’, once featured on The Discovery Channel. In one of episode, Eddie Izzard learnt a few Old English phrases, and subsequently took a trip to Friesland to meet a local Frisian-speaking farmer. Interestingly, Izzard asked the farmer if he could buy a cow, speaking in Old English, and the farmer understood most of the conversation. An excerpt from the series can be found here. Frisian: Ik wolde net lyk it te rein oer de neist wyk. English: I would not like it to rain over the next week. I am sure if teenagers realised that their style of writing/speaking is scholarly enough to be comparable to Old English or Frisian, the latest trend of “text talk” would soon appear less “cool”, and perhaps we might gradually see it begin to fizzle out. I am sure that would come as a relief to some of us. If the English language is reverting back to Old English, perhaps Old English fashion will also repeat itself? 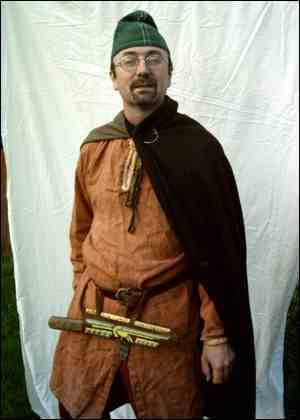 Who reckons we’ll be seeing this example of 11th century “chic” worn by today’s teenagers…? … Maybe not. This entry was posted in Education and tagged Education, English, Frisian, History, Humor, Humour, Language, Media, News, Old English, Politcs, School, Society, Teenagers. This article is excellent. It combines interest with humour! – I like it.